Snapped a picture of my office ledge rocks at work today. 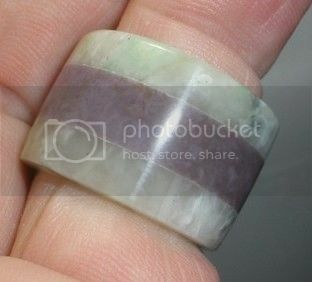 They're chosen because they look cool, not because they have any lapidary purpose. The green is, unfortunately, a very thin smooth layer on an otherwise unremarkable piece of tuff. 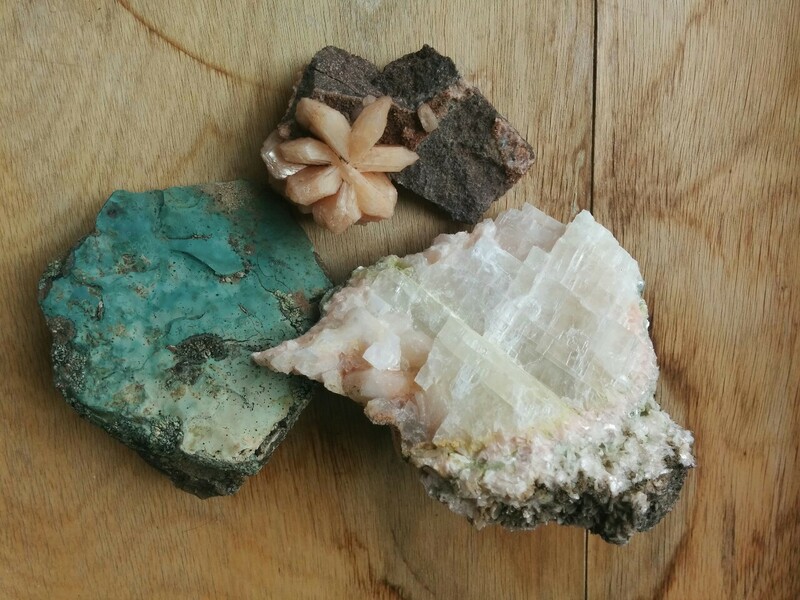 The white is a faintly green calcite surrounded by a faintly pink calcite, and the flower is cool. I think calcite but am not sure. It came from a fairly annoying location but I do want to go back and see if I can find more. The flower has gotten some attention in the office! Wild guess: Heulandite.I will look in some books this evening. Yep I think franks right. Goodearth(joshua) has a friend in Idaho I believe with a claim that has heulandite on it. I'd love to get my hands on a sweetie pie like that "flower" Its too friggen cool lady! Heulandite it must be, then! Other pieces in the area had the fine orange crystals broken up by larger ones, and look a lot like the pictures on google. Well I might just have to go back up there, annoying or not, and see if I can't find more flowers. The streaks of crystal are in weathered purple tuff up on a bare hillside, very steep and prone to filling one's boots with gravel. No danger of falling off anything, just of rolling down into an undignified heap. No danger of falling off anything, just of rolling down into an undignified heap. A loss of dignity is a requirement for gathering many types of rock . I can only imagine how horrible I have looked after either a day digging rocks or packing out a heavy load of rocks.I like to think that our disheveled appearance at times is just a sign of determination. Haha yeah I can agree there! I have an image to maintain and defend; I can get into any scrape I like, provided I can get back out of it without being seen! In all seriousness I'm headed back up there on Sunday if the weather's bad. If weather's good, I'm headed for interior Donnybrook and then up to Richardson's. Oh no, undignified heap will not do. When you start rolling spread your arms and legs out wide so you stop rolling and start sliding. When you reach the bottom jump up like it was all planned. People will say "wow, that lady has skills" and think "jeeze, I wish I had the courage to get down a hill like that". You will be a hero. Keep in mind that I have only practiced this while skiing so surfaces may vary the results. I do admire your grit and humor when things don't turn out exactly the way they were planned. Parallel life styles except that I just photograph snakes, not eat them. Do you follow in the footsteps of your father, mother or both? Looks like you were raised right. By the way, it does not matter which rocks trip your trigger, and you have the freedom of liking whichever ones you want. You will not find anyone on here that will criticize because we all do the same. 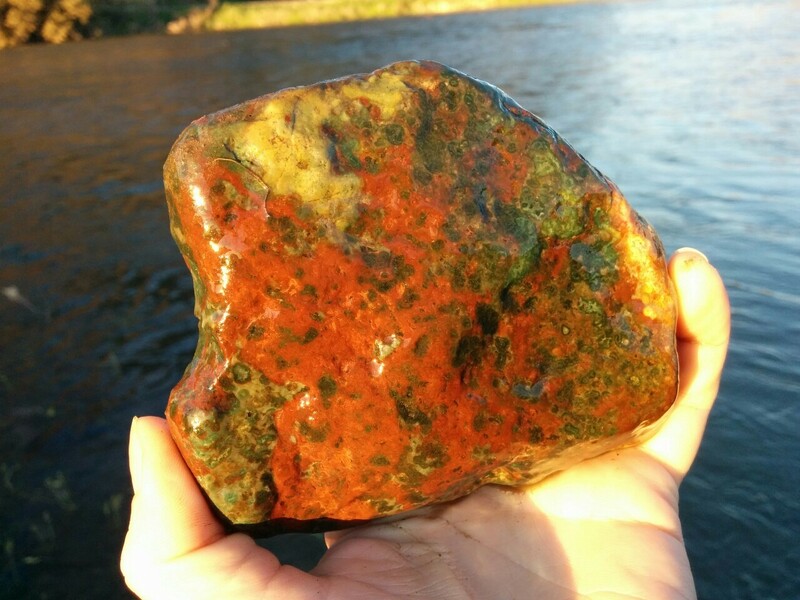 I have a speckled rock that only a father could love and there is no way I would give it up and I am quite sure nobody would ask for it. Babblings good , it is the only way to tell just how bad this rock hound disease really is. When you reach the bottom jump up like it was all planned. This is how I ski. I did find more, but no flowers (I should know better than to expect to find the same thing twice!) just some fairly nice plates and small pieces, and some other interesting material. Filled my boots with gravel, but managed not to go tumbling! I will post pictures when the rocks are clean and I've got light. Excuse the cell phone photos, but here's some! No more perfect flowers, but did find a good vein of nice-sized crystals. Unfortunately water seeped down into some of it and some are covered with white water scale, but some are quite pretty. Gave a nice piece to our church pastor, who is a retired oil geologist. River jasper from the John Day. I set it down and it got dark, and now I have to go find it again. 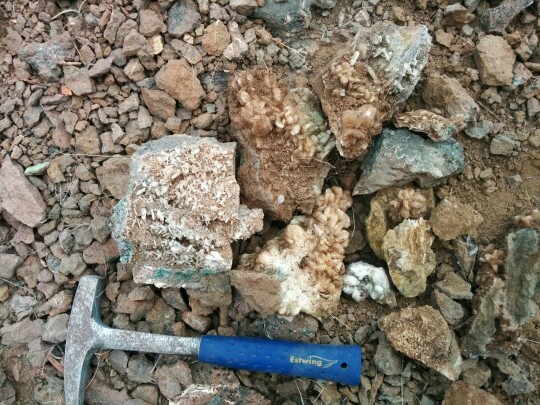 Looks like you have lots of zeolites just like the sw Washington volcanics. Nice pictures. Yeah, lot of volcanic action here too. 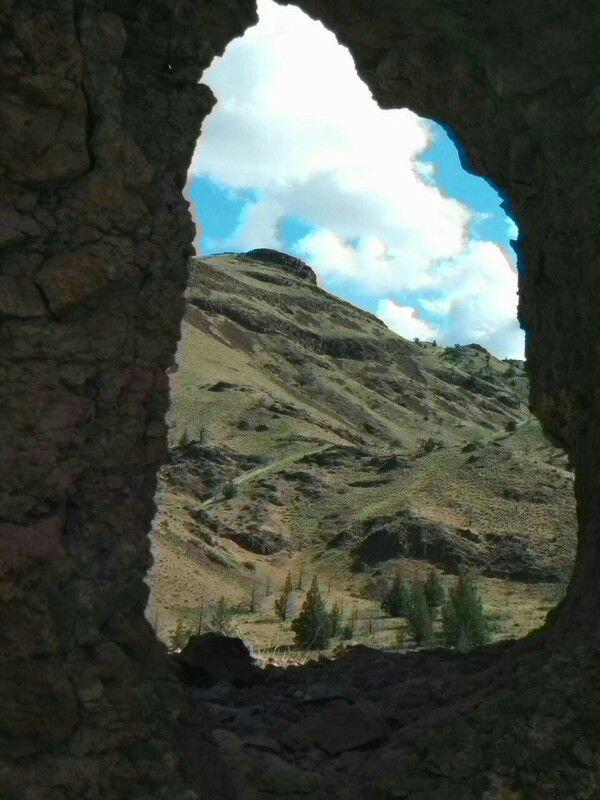 I think well over a hundred distinct volcanic events are known from basalt & mud flows in the region. I'm starting to pay more attention to the zeolites. 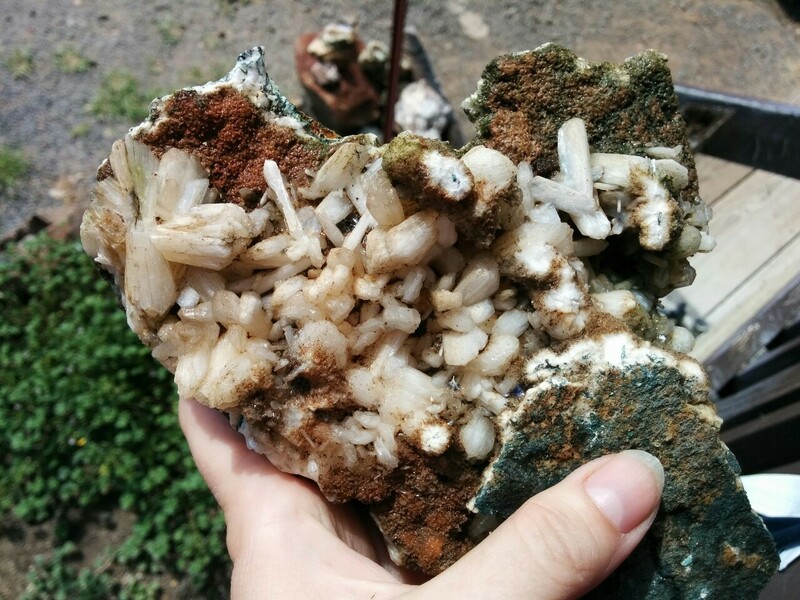 It used to be 'if it's not quartz, it's calcite,' but it's a lot more complicated than that! There's a dark silver calcite that weathers purple, a fan-shaped crystal spray that forms on flat surfaces, and others, that I used to just ignore. Now I want to go find good samples and find out their proper names.